Radtke Sports uses an online databased authentication system. 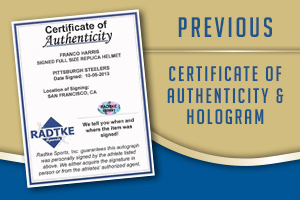 When you receive your item you will have a Radtke Sports Databased Serial Numbered hologram affixed to the item, certificate of authenticity explaining where to go to authenticate the product, and a picture of the celebrity signing (when available). Example images of the certificate of authenticity and hologram are below. 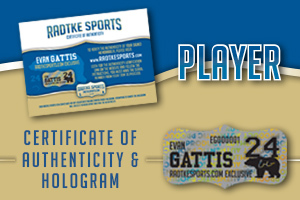 When you purchase an item from our exclusive athletes Ken Stabler, Brett Favre, AJ Mccarron, etc.. you will receive a Radtke Sports Exclusive Player Databased Hologram, a Radtke Sports Exclusive Player Certificate of Authenticity, and a picture of the athlete signing (when available). Example images of what you will receive are below. 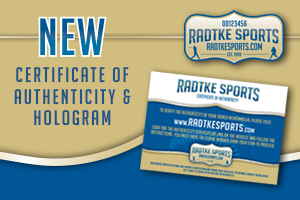 Previous to the new databased authentication system, Radtke Sports used a paper certificate of authenticity with dual matching serial numbered holograms. One hologram would be affixed to the item and one hologram affixed to the certificate. These holograms were NOT databased. If you would like to re-submit your item to be authenticated with our new hologram, we will re-authenticate the item for a $10 fee. You will be required to pay for the item to be shipped to us and back to you. Examples images of the old authentication are below.